My mom was the one who encouraged me to wear henna. 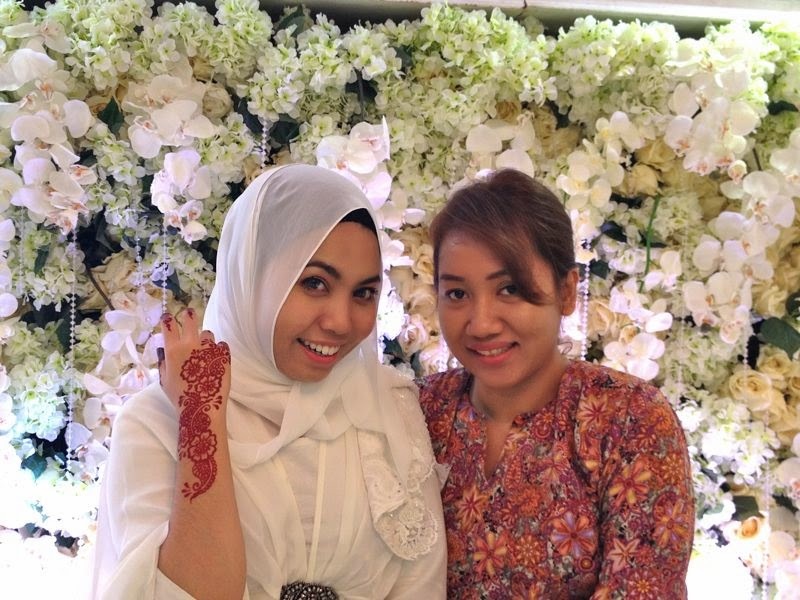 She said, wearing henna is a really nice feeling for the bride-to-be, that no bride should miss! And I completely agree! The moment you saw that red color on your hands and feet the night before your wedding, you'd feel like a bride instantly! There's just something magical about henna that gives you this happy, excited feeling! And when the wedding ceremony is over, it'll be like one of those "indicator" saying that "I got just married! or "Saya pengantin baru! 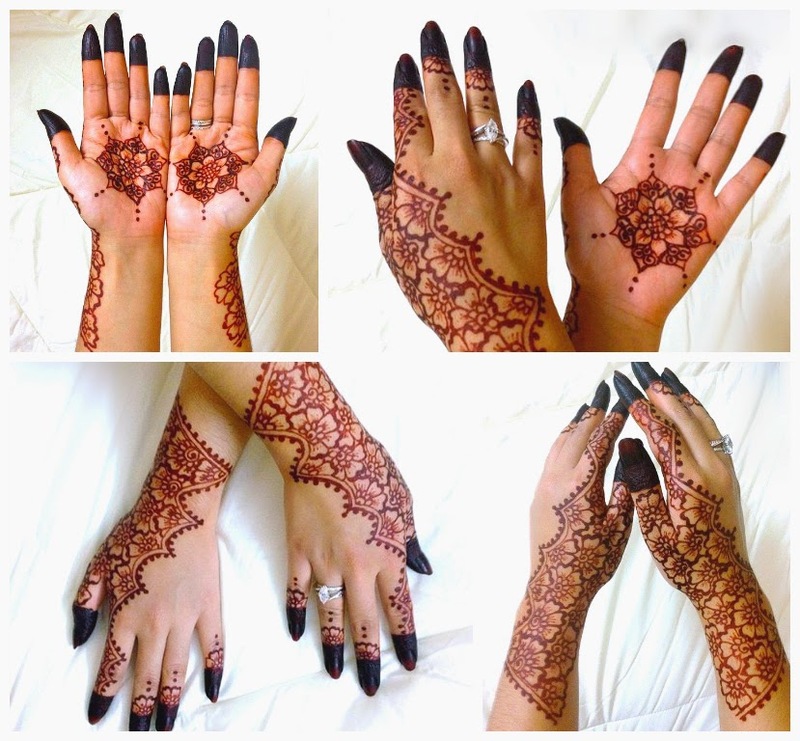 ", having henna attractively shown on your hands/nails! hehe. 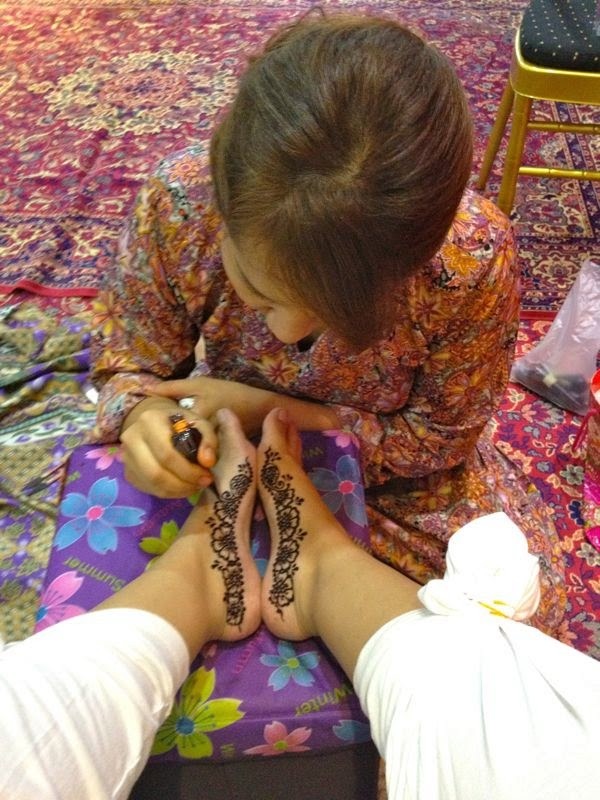 She used her own inai, that she made it herself.. She brought lots and lotsa henna with her! They're really beautiful color! You can even buy the inai tubes from her if you'd like.. 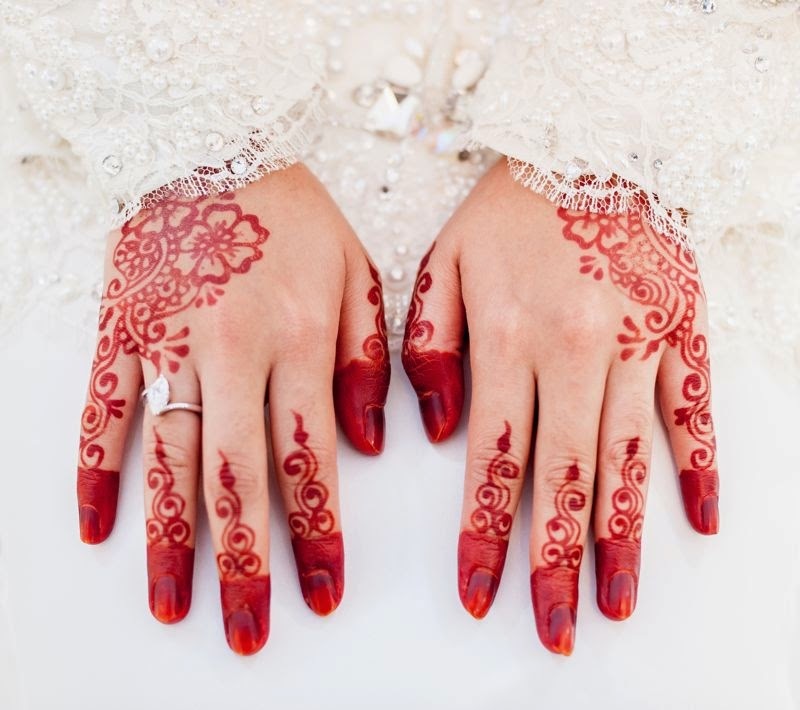 If I'm not mistaken, her inai is from Yemen and she mixed it with some kind of oil (I'm not sure what was it), to produce this beautiful red henna! I honestly love her work! It's lovely! Kemas, cepat and cantik! You would definitely be satisfied! I'm not saying this because she sponsored me, but I'm saying this because I really do love her work! 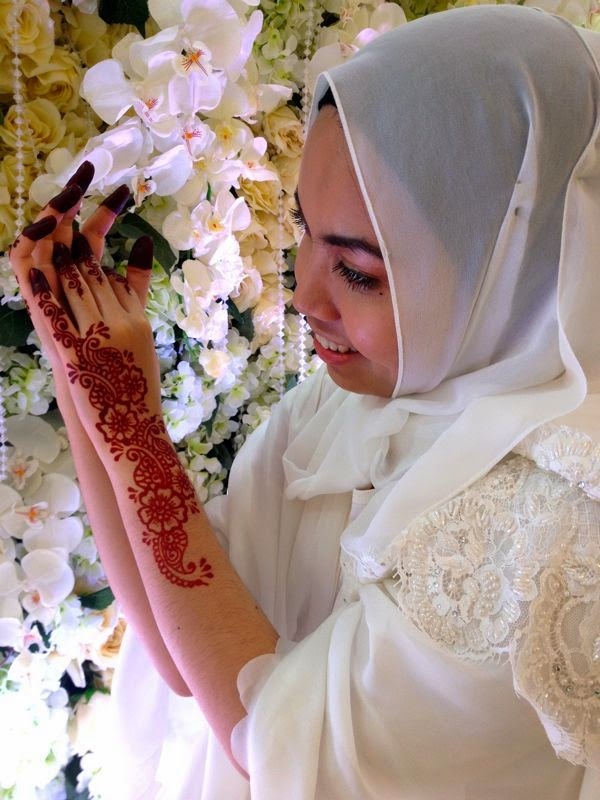 This picture above is my second time wearing henna for the Reception 3, my husband's side. I love this design! It's like a lace glove! Sat on my mini pelamin, while Kak Noor did my inai. Sorry no picture of the head. I didn't wear my scarf that night. Oh yeah.. one tip that I should share with the brides-to-be out there, please don't wear skirts or long dresses for your mehndi night. Really hard to take care of your baju while letting the henna dry. I wore this white Kaftan dress from Radzuan Radziwill with a pair of cotton pants. So it was really really comfortable and breezy. 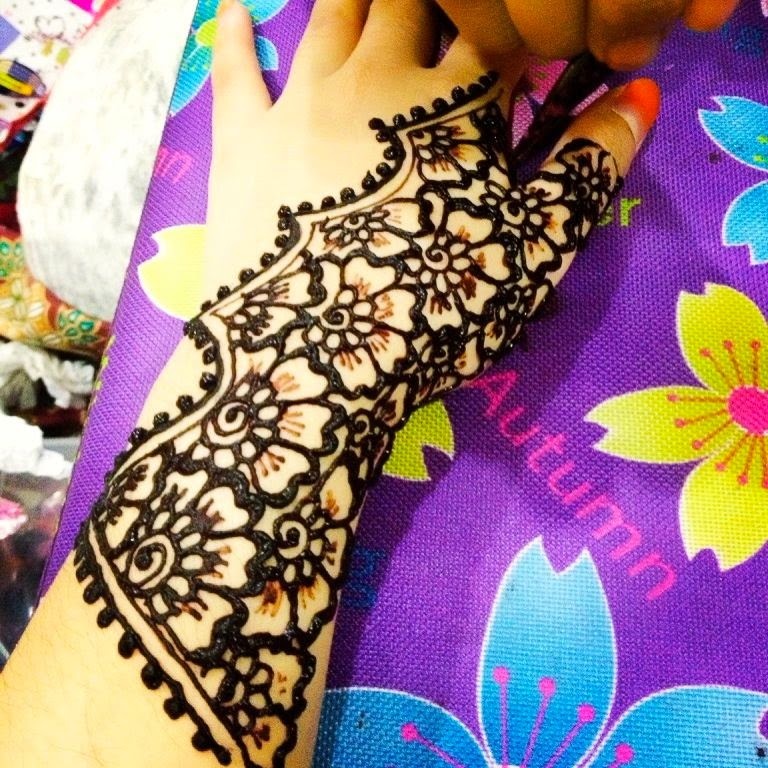 Easier for my henna artist to do her work too! Or you may sit like a princess and eat your dinner too if you haven't had anything since afternoon! Since we have canceled the caterer, we ordered pizza instead! Fast and yummy! hehe. I had my Khatam Quran Ceremony that morning.. I was so damn tired, I could faint! So I took nap every few minutes while she did my hands and feet. But it was kinda hard to sleep when you know you had to guard them with very great attention while waiting for the henna to dry up! haha. So in the end, I spent time talking with her. She's really talkative and friendly too! She shared with me lotsa stories and experiences... It was a fun night for me! By the way another tip that I'd like to hightlight here is regarding the manicure. If you wish to have henna on your nails for your big day, I would advise you please do not spend your money at the nail parlour! They're such a waste of money! Why? Because your inai won't stick to your buffed nails if you do so! And they would look blotchy..and unfinished. 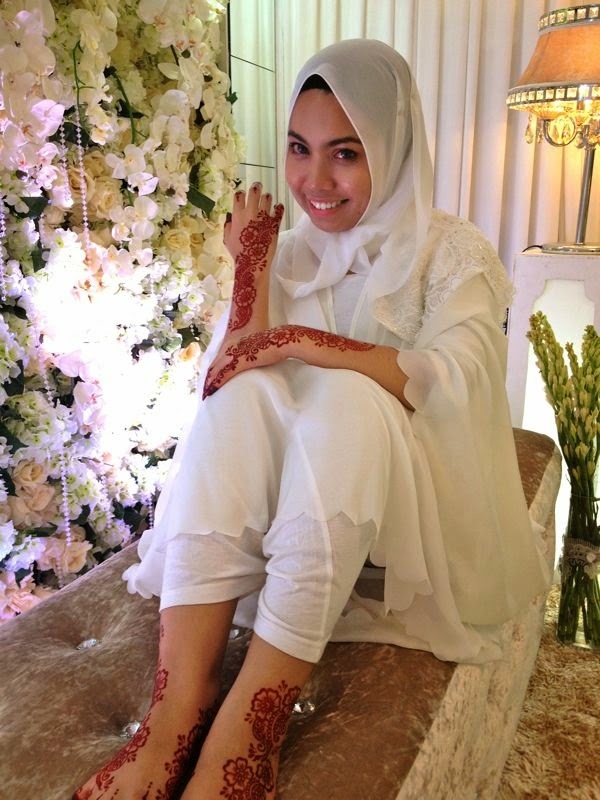 And not to mention, tak cantik! So just save that money and go buff your nails on some other days ok? NOT for your wedding, unless you decided to go naked for it! Thank God I was told about this, so I didn't do any! So my inai turn out to be just fine! If you don't prefer the intricate designs like mine, just wear them on your nails. That'd be nice too! Simple and clean. The picture above was my second time wearing the henna. For my husband's side of reception. The reception was held this year, a month apart from my reception. So that's why I needed to have my inai again! The reason why the nail cap part looked so black instead of red, because I wore it two days before the reception. Kak Noor was not free to do a day before my reception. So she created a super red formula, for it to become the perfect color, two days later! You can view the inai on my hand here - The color turned out to be just fine on that Saturday! But.... I gotta say, wearing it for the second time, just not the same feeling when I wore it for the first time! This is what's left on my nails now! It looks like a French manicure, no? But the Malaysian version of course! hehe. I'm gonna have to cut them off soon! Good bye my wedding-nails! You've been my best friends for 4 months now! She charged RM 250 to RM 350 depending on the area of your place. That price already included transportation fee. She has many designs to choose from, and you only need to spend time 2 to 3 hours and you'll be free! She would clean it for you and ensure that everything is perfect before she leaves - So no need to guard your hands with plastics and all! - That's old school and really messy! Her technique lets you sleep soundly throughout the night (although I only slept for 3 hours because I can't sleep, too excited for the wedding! LOL). 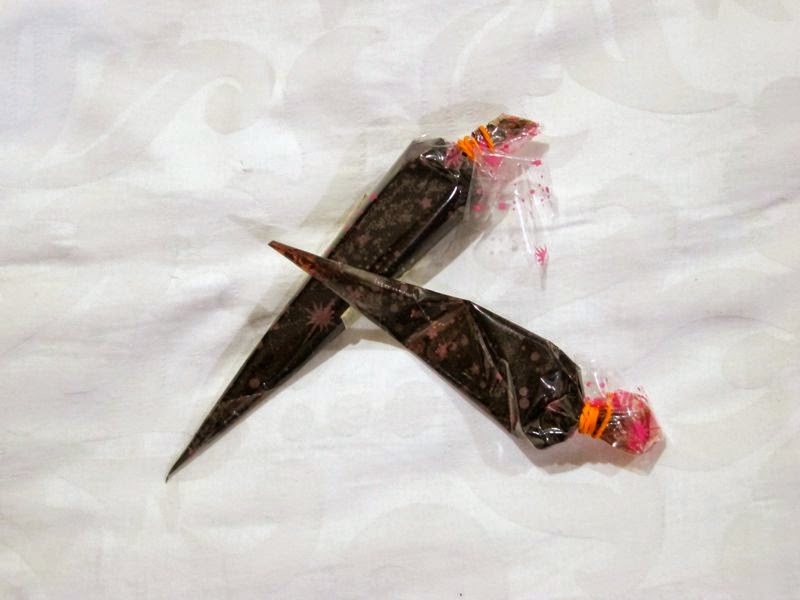 Many celebrities like Sazzy Falak, Leuniey Natasha, Liyana Jasmay, Abby Abadi, Fiza Elite, Norjuma Habib, Dinaz, Nora Danish and many more used to do with Kak Noor! 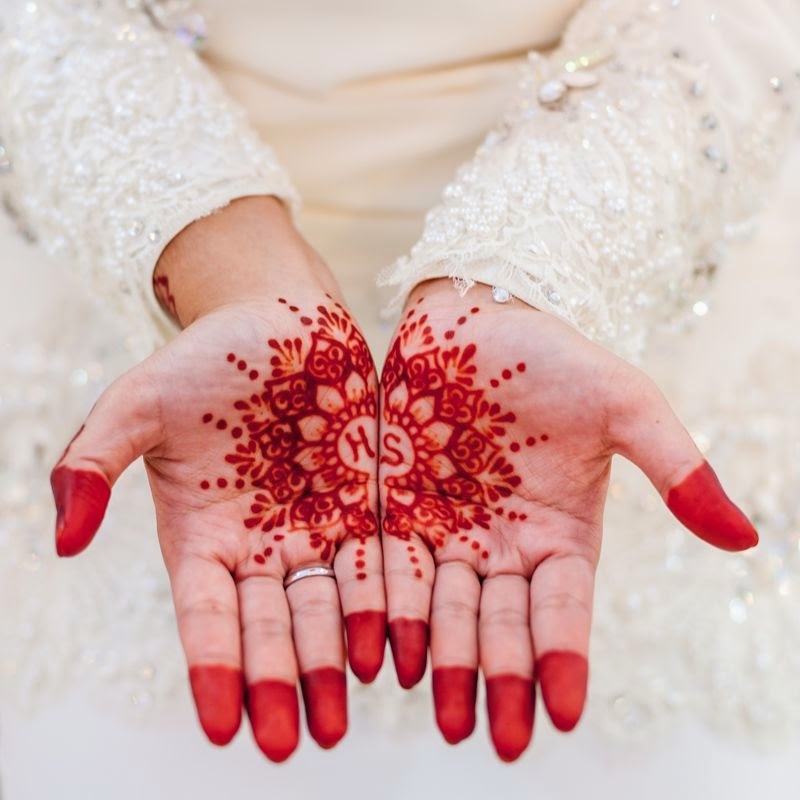 P/s: If you sign up a bridal spa package at Sri Dahlia Spa, you're entitled for a FREE henna session for your big day! Labels: Reviews , Road to My Wedding! Hi Wani, I would like to apologise for my comments on your engagement attire. 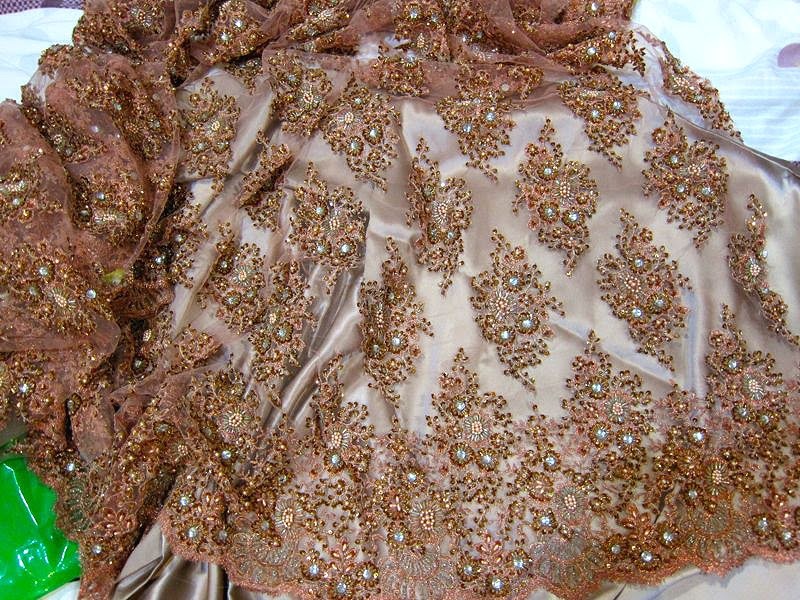 Looking back, I think your engagement dress suits you best reflecting both your attitude in fashion and cultural background. What made me say this? 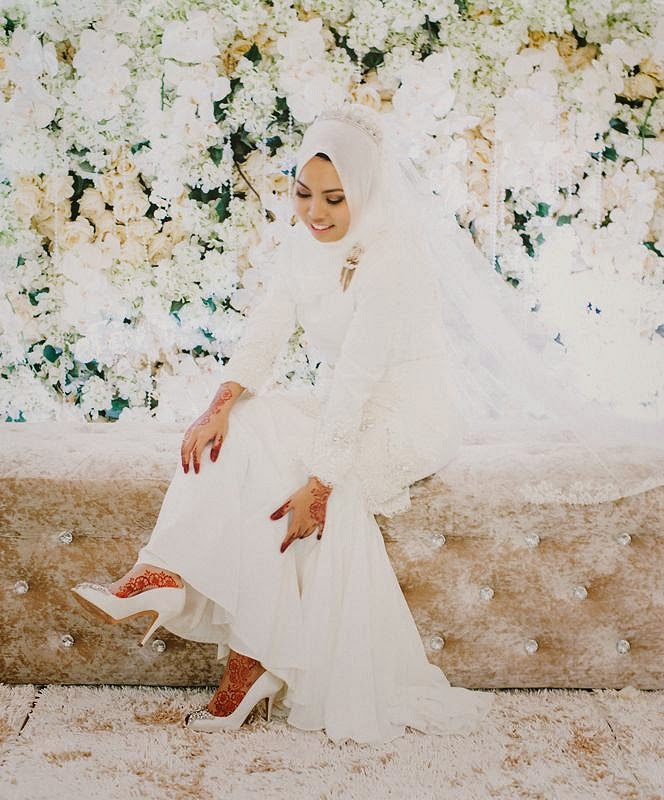 looking at your wedding pictures, you look just like any other Malaysian brides, costumey and drenched in western lacey wedding dream. You lost that edginess, suddenly you are just like anybody else. Please accept my apology. Whisper's Guide to Menstrual Cramps! Key to His Consciousness: Always Smell Good!